Ukrainian troops stand in formation during a training exercise in Poland. Via the US Army Europe. What compels ordinary people to mobilize for violence when their government demands it? We consider evidence from the Ukrainian government’s recent efforts to recruit young men into service to defend against incursions by Russian forces and Russian separatist uprisings on Ukrainian territory. 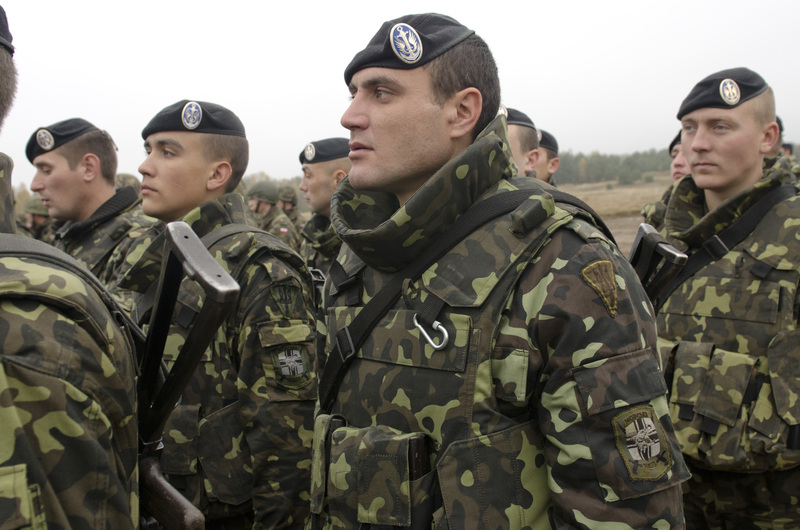 Since March 2014, the Ukrainian government has sent letters to young men from across the country, requesting them to report to their local recruitment stations to register for service. Those who do not comply face threats of fines and imprisonment. Although such letters could be considered as draft notices, some Ukrainian men report for service while others do not. In July 2014, we surveyed 100 young men who, after receiving such notices, had come to enlist at local army recruiting stations in Kharkiv, a major city in Eastern Ukraine, near to both the Russian border and ongoing separatist fighting. We report here some initial findings from our research on why people mobilize for violence. Patriots Defending the Nation or Zealous Revenge-Seekers? At first glance (see Table 1), many young fighting men exude patriotism. No one claims to have felt compelled to join as a result of a compulsory draft. Instead, these young recruits appear to be willful volunteers. 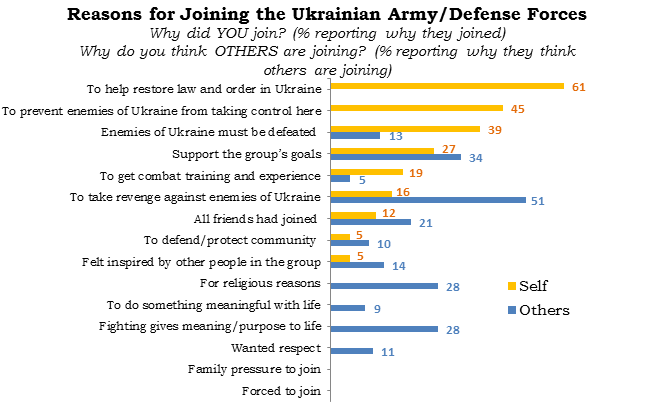 When asked in the survey to choose the reasons why they wanted to fight, over half (61%) said they wanted to help restore law and order in Ukraine. Forty-five percent also wanted to prevent enemies of Ukraine from taking control, and another thirty-nine percent believed Ukraine’s enemies must be defeated. For military recruits to rally around their flag and vow to defend their country in times of war is not especially counterintuitive. Patriotism could provide the moral fortitude to volunteer for a potentially brutal war with a formidable enemy. However, we also find evidence of other motives for volunteering beyond a patriotic commitment to defending the state. When we ask new recruits why they think others are joining, about half (51%) think volunteers are primarily revenge-seeking. Twenty-eight percent also say their peers are fighting for religious reasons and that joining gives meaning to their lives. Few (5-10%) percent claimed to have joined or believed their peers had joined to protect their local community from attack. No one seemed to believe their comrades were signing up primarily to restore law and order or deter future attacks. If young Ukrainians are mobilizing either to defend against or seek revenge on a common enemy, who or what do they mean? One concern is that the conflict in Ukraine is increasingly one of social identity cleavages between Russian speakers and Ukrainian speakers. When we ask people how close they feel to Russian speakers, however, we find that most active recruits and ordinary civilians we interviewed in Kharkiv, who all identify as Ukrainian speakers, feel about as close to Russian speakers as they do to fellow Ukrainian speakers in general. Only Russians from Russia and those Russian speakers in separatist regions of Ukraine appear to trigger distancing responses. Social distance, however, does not equate to fear, hatred, or blame for the current crisis. 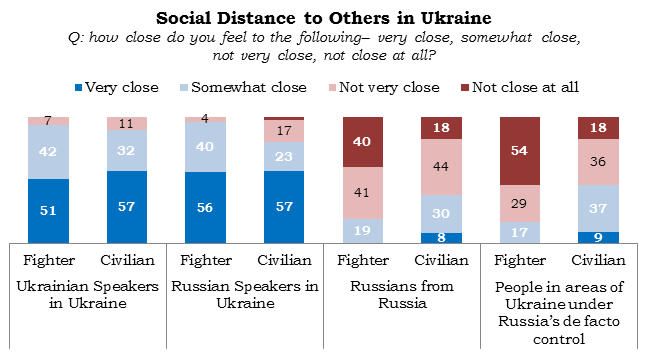 We find that most fighters and civilians we interviewed in Kharkiv this summer reject claims that Russian speakers in Ukraine are disloyal citizens, who support Russia’s efforts to occupy Ukrainian territory, and who would rather be citizens of Russia than Ukraine (see Table 3). 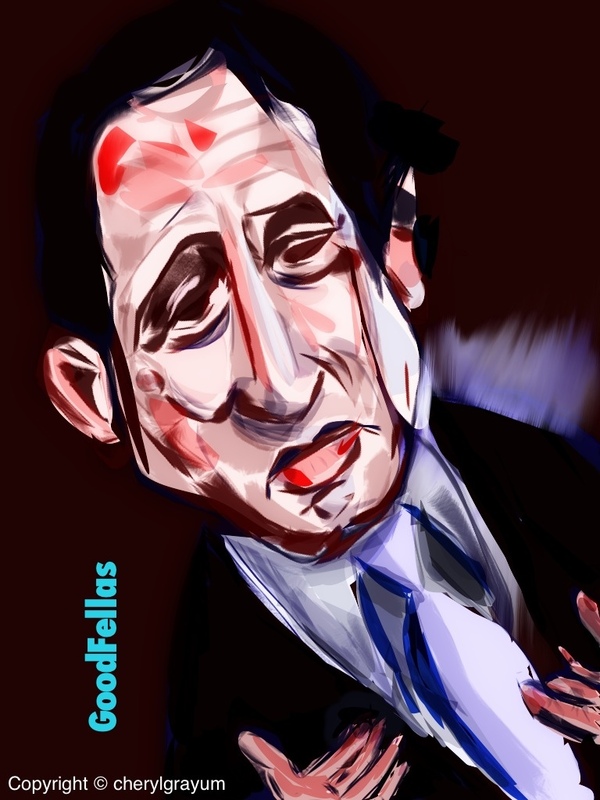 They also do not believe that Russian speakers in Ukraine support Vladimir Putin. Most think Ukrainians have nothing to fear from Russian speakers. Instead, most Ukrainians we interviewed place blame for violence and unrest in Ukraine squarely on Russian President Vladimir Putin. 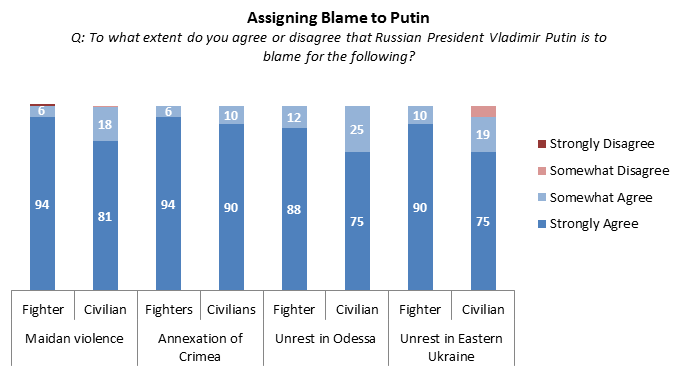 Overwhelming majorities of fighters and civilians we interviewed blame both for the Maidan violence, annexation of Crimea, stoking violence in Odessa, and separatist violence in Eastern Ukraine (Table 4). Comparable majorities also place blame on Russian special operations forces under Putin’s command and control. More fighters we interviewed desire Western military intervention in the crisis than civilians (Table 5). US military intervention is supported by 45 percent of fighters, compared to only 22 percent of civilians. NATO intervention is similarly viewed more favorably by fighters. Civilians surveyed were much more interested in non-lethal methods of handling the conflict. Among civilians, 72 percent favored UN peacekeeping. Half of civilians also favored sanctions compared to only 33 percent of fighters. 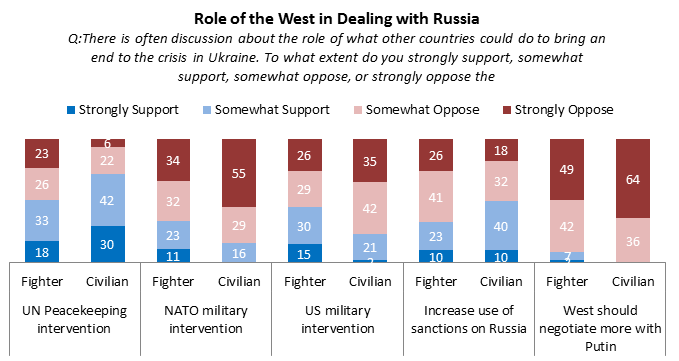 In contrast, few fighters or civilians want to see the West take a more active role in negotiating a settlement with Putin, perhaps out of fear that any deals struck may undercut the ability of Ukraine to regain lost territory. Differences of opinion on the way forward will make any decision of Ukrainian President Petro Poroshenko unpopular with one camp or the other, as evidenced by protests by Ukrainian fighters over the recent cease fire agreement. Even if the Ukrainian military honors these recent agreements, some of these young fighters may find other informal militia outlets to press the fight onward. Given these young fighters’ motivations, the durability of peace in Ukraine is tentative at best. Fighters sampled by cluster-sampling at recruitment stations, with random selection of fighters by cluster. For comparison, we also survey 100 other young men who live in the same communities (and have also received recruitment notices), but have chosen not to report for duty (N = 200). 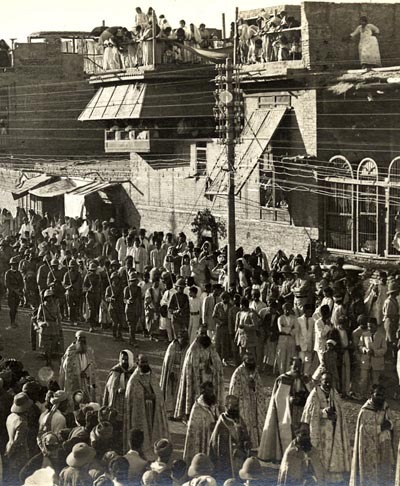 Civilian males were sampled by random route in the vicinity of recruitment stations. Sam Whitt is a professor of political science at High Point University. OK. But they lost, badly (30,000 killed) to a group of local people defending their homes. And don’t start with the ‘Russian army’ nonsense. Despite satellite, drone, border patrol and OSCE monitoring, there was not the slightest evidence of Russian involvement. No one felt forced to join? That sounds like a 100% of voters voting for Saddam Hussein in a democratic vote. I just do not buy it!